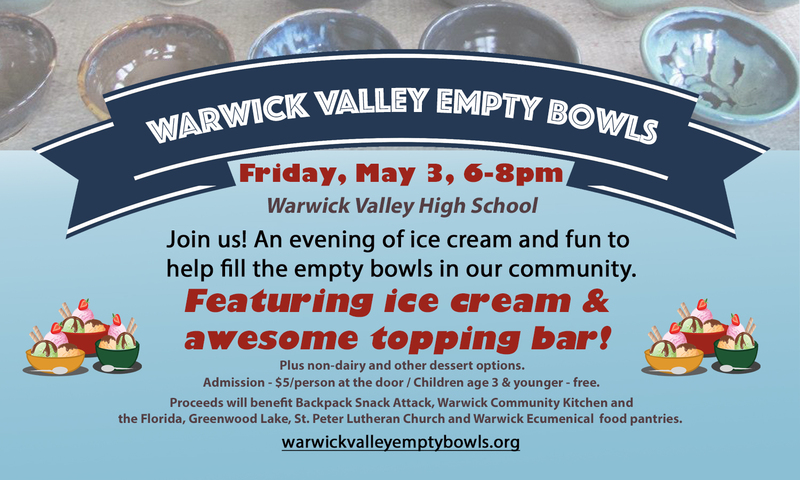 Warwick Valley Empty Bowls – Join us! An evening of ice cream and fun to help fill the empty bowls in our community. Join us! An evening of ice cream and fun to help fill the empty bowls in our community. 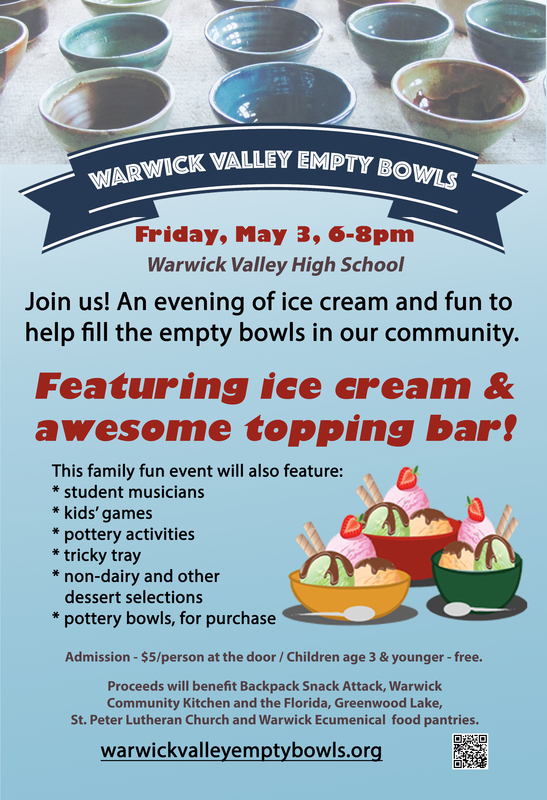 Warwick Valley High School will host Warwick’s 11th annual Empty Bowls event on Friday, May 3. At this family event, community members will join students for an ice cream social and family fun evening to fight hunger in the Warwick area. Empty Bowls will be held 6-8 pm in the South Cafeteria at Warwick Valley High School, 89 Sanfordville Rd., Warwick. Enjoy an evening of ice cream, non-dairy alternatives and desserts with an amazing toppings bar, student music, kids’ activities and clay projects, 50/50 and Tricky Tray. Beautiful handmade bowls, donated by talented WVHS Empty Bowls Club members and local potters, will be available for purchase. A representative of Altice will present a $1000 award to Warwick Valley Empty Bowls 2019 and $250 to the WVHS Empty Bowls Club through its “Charity Champions” program that supports community service projects in area high schools. Admission is $5/person at the door. Children age 3 & younger get in free.